The best way for kids to beat the summer heat is to go for a dunk in the water, preferably with friends. 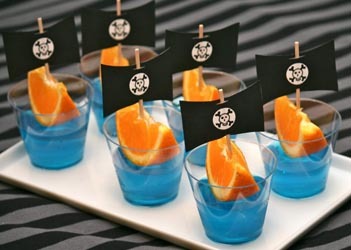 If you’re planning a pool activity for your little Pirate this summer, make your child’s little black heart happy with an exciting Pirate-themed party. Here are a few easy ideas to tie in your child’s love of the Pirate101 game with the perfect Pirate pool party. As party favors, give an eye patch and/or an inexpensive costume Pirate hat to each child. To make it more interesting, though, assign each hat and eye patch combo a different identity from the Pirate101 game, and have the kids choose their identity for the duration of the party. Prevent fights by making grab bags so they don’t know who they’re getting. Boochbeard, Captain Horace Avery and Morgan LaFitte are examples of Pirate101 characters you could use, but if you need help, be sure to ask your own little Pirate — he or she is sure to have suggestions! Instead of handing out all the favors in goody bags, make your little Pirates work for them. Put treasure such as colorful Mardi Gras necklaces and plastic jewels at the bottom of the pool, and let everyone take turns diving for booty to fill their goody bags. This is a great Pirate’s game that the kids will love. 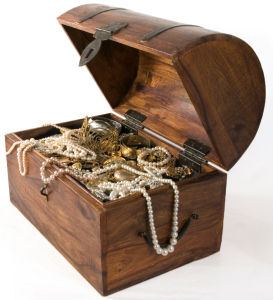 Weight the treasure with diving rings or rocks to keep it on the bottom, and put the better treasure in the deeper areas of the pool. You can also sink bags of plastic coins (call them Crowns to tie them in with the game) by putting a rock in with the coins. Looking for more Pirate party games? Divide the kids into two teams and set up a game of Capture the Flag, with a flag tied to a flotation device at each end of the pool. Prohibit dunking and encourage kids to test their swimming skills against one another in their race to capture the other side’s flag first. Have the losing team “walk the plank” by walking off the diving board one at a time. Another fun activity that will keep your little Pirates busy involves putting them to work making boats, and holding a contest to see whose creation floats the longest or holds the most weight. Provide a variety of materials such as paper, cardboard, craft sticks and egg cartons, and let the kids use their imaginations. When it’s time for the contest, use “Crowns” to weight each boat equally and see which one stays afloat the longest. With all the swimming, contests and walking the plank, your little Pirates are bound to get hungry and thirsty. You can keep them well-hydrated by serving cups of blue-colored water or juice with Swedish fish in it, or various colored drinks with the names of potions or elixirs from the game, such as the Energy Potion or the Health Elixir. Treats can be as simple as bite-size pieces of fruit skewered on little plastic cocktail swords or wooden kabob skewers, or real-life replicas of the snacks found in Pirate101. Yo-ho-ho! Planning a swashbuckling pool party for your wild band of Pirates is a lot of fun, not to mention it gives you a chance to demonstrate that even landlubber moms and dads can put together a pretty cool party! These ideas will get you started, plus your Pirate101 player may have some suggestions for other games or snacks. What tips do you or your kids have to make a Pirate-themed pool party a rip-roaring success?